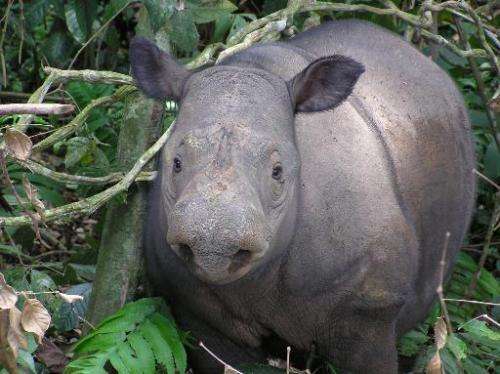 Sixteen camera traps—remote-controlled cameras with motion sensors frequently used in ecological research—filmed the rhino walking through the forest and wallowing in mud in Kutai Barat, East Kalimantan province. "This physical evidence is very important, as it forms the basis to develop and implement more comprehensive conservation efforts for the Indonesian rhinoceros," said Indonesian Forestry Minister Zulkifli Hasan. "This finding represents the hard work of many parties, and will hopefully contribute to achieving Indonesia's target of three percent per year rhino population growth." There are estimated to be fewer than 275 Sumatran rhinos remaining in the wild, according to the International Union for Conservation of Nature (IUCN). There are only a few substantial populations still in existence, most of them on Sumatra. Poaching is considered the main reason for the dramatic decline in numbers, with the rhino's horn and some of its other body parts considered highly valued in traditional Chinese medicine.